It’s been quite a while since there has been a new edition of the “Remember When…” series, so today we’re bringing it back with a look at one of the most shocking (yet somewhat under recognized) moments from the early 90s. In 1991 it was clear that the WWF and WCW were the two major pro wrestling companies in the country, and while they were in competition with one another, you would never hear one acknowledge the other. Hulk Hogan had been the top WWF guy throughout the 80s and Ric Flair was that guy for WCW (formerly the NWA.) The dream match between the two was the darling of wrestling magazines and fan conversation, but a real encounter was something that never seemed like it would be real…until a bombshell dropped by Bobby “The Brain” Heenan on an otherwise typical episode of “Wrestling Challenge” changed everything. 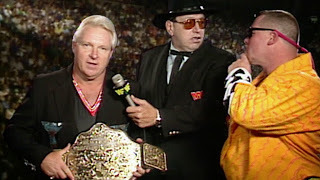 As the syndicated show was wrapping up with the traditional look at next week’s action, Bobby Heenan shocked hosts Gorilla Monsoon and Jim “The Anvil” Neidhart by debuting what had been the WCW/NWA World Heavyweight Title for the previous 5 years. Monsoon tried his best to pretend not to know what belt it was, but to anyone that was a fan the belt was instantly recognizable. The utter confusion over seeing THIS belt on WWF TV and what it could mean was the perfect setup for Heenan to drop the REAL bombshell…coming soon to the WWF, was Ric Flair! Ric Flair had been “suspended” from WCW just weeks prior and stripped of the title, but this made it clear that Flair was still in possession of the actual belt. The backstage problems in WCW at the time are another story for another day, but ultimately Flair left the company without losing the title to anyone and kept possession of the belt itself. Now this of course was before the Internet and before tons of people pretty much had an idea of what was going on in wrestling, therefore even though Flair was “suspended” from WCW as the story went, there wasn’t even a thought (at least in my mind) of the icon of the NWA and WCW actually going to the WWF prior to this day. This bombshell that took only less than a minute to drop had opened the door for what in my mind was going to be the greatest dream match/feud in wrestling history….Hogan vs. Flair!